The Palette Browser dialog allows you to decide the level of palette list and palette storage to use when you want to create, clone, link to or import a palette. This dialog only appears if you have the Advanced Palette Lists preference enabled, which is disabled by default. When Advanced Palette Lists mode is disabled, Harmony automatically stores palettes in a scene's palette list, inside the scene's palette-library subdirectory—see Enabling the Advanced Palette Lists Mode . NOTEFor tasks related to this dialog box, see About Palettes. This allows you to browse for the physical location of the palette file in your database. If you are using Harmony Stand Alone, you can still select the scene's own job or environment as a location. Stand alone scenes have a provisional job and environment storage space inside the scene's directory. The files in these storage spaces can be imported into a database scene's actual job and environment when importing the scene to a Harmony database. 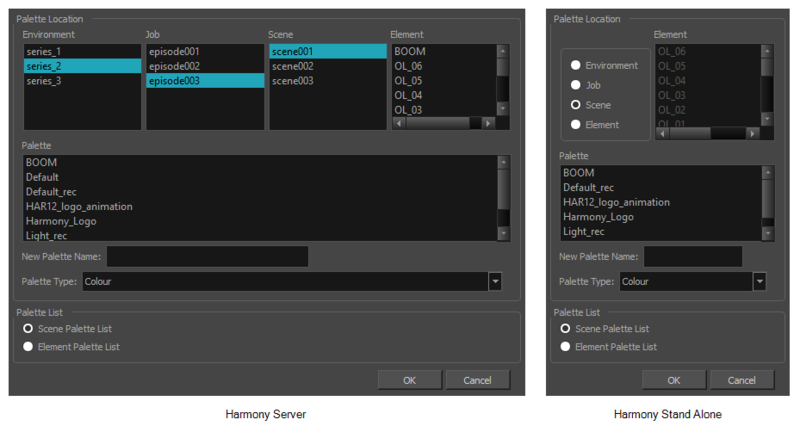 If you never intend to use Harmony Server, you should keep your palettes inside your scene or element's palette libraries. Stores the palette file in the selected environment's palette library. Environments are typically used to contain a whole production, series or feature film. In Harmony Server, this stores the palette in /USA_DB/environments/[environment name]/palette-library. In Harmony Stand Alone, this stores the palette inside the scene's directory, under environments/Digital/palette-library. Stores the palette file in the selected job's palette library. Jobs are typically used to contain episodes in a series, or any set of scenes that is intended to be put in the same sequence. In Harmony Server /USA_DB/jobs/[job name]/palette-library. In Harmony Stand Alone, this stores the palette inside the scene's directory, under jobs/Digital/palette-library. Stores the palette file in the selected scene's palette library, which is the palette-library subdirectory of the scene's directory. Stores the palette file inside the selected element's palette library. This library is located inside the scene's directory, under elements/[element name]/palette-library. This lists the existing palettes in the selected location. If you are creating or cloning a palette, use this field to enter the palette file's name. The palette will be listed under this name in your palette list. On your file system, it will be named after its palette name, followed by the extension .plt. Colour: A colour palette can contain colours, gradients and bitmap textures. Pencil Texture: A pencil texture palette can contain textures to apply as transparency filters to pencil lines, in combination to their line colour, to create various styles of pencil lines. For more information, see About Pencil Line Textures. This allows you to decide if you want the palette to be added to your scene's palette list, or to the currently selected element's palette list. Adds the palette to the scene's palette list. Palettes in the scene's palette list are available to all the elements in your scene. This is especially useful if you are doing digital animation, where character models can be made of many layers that need to use the same palette. Adds the palette to the currently selected element's palette list. Palettes in an element's palette list can only be used by the drawings in this element, and will only be listed in the Colour view when this element is selected. This can be useful if you are doing traditional animation, where each character is usually drawn on a single layer, and you want each layer to have its own palette.